Lauterbrunnen is a small, quiet town in the traditional Swiss style, situated in the eponymous beautiful valley in the canton of Bern, Switzerland. 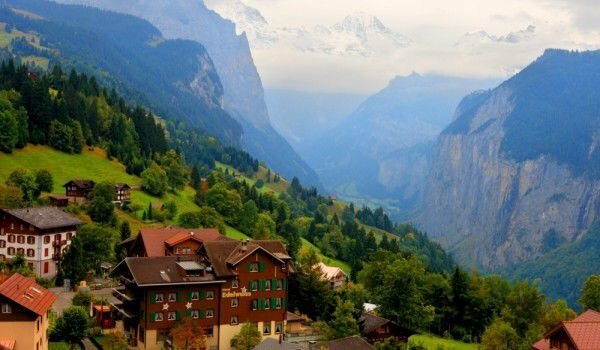 The whole valley is a place of scenic mountain views, among which are scattered some of the best resorts in the country, including Wengen, Mürren, Gimmelwald, Stechelberg and Grindelwald. Lauterbrunnen itself is situated right at the entrance of the valley and the station is the starting point for any adventure in the region - to Wengen or to Interlaken and the majestic Mount Jungfraujoch. Nestled among huge rocks and majestic mountain peaks, Lauterbrunnen valley is popular for its rich and incredibly beautiful alpine scenery. Here are concentrated around 72 waterfalls, meandering rivers, lush meadows, covered with fragrant flowers and rich green grass, with everything you can imagine when you hear the Swiss Alps. Literally translated, the name Lauterbrunnen is translated as "the clear well." Lauterbrunnen town itself is small, quiet and has retained the old charm of the traditional Swiss village, nestled among alpine panoramas. If it is a problem to crawl Lauterbrunnen on foot, bicycle rentals are available to everyone. At the entrance of the village is where you can take one of the most beautiful scenic railways to Grütschalp, on the way to Mürren. Go and walk, and overcome some 690 meters in two hours, filled with fabulous mountain views. Before the town of Lauterbrunnen, steep roads lead to the small village Isenfluh, where one can take a lift to the peak Sulwald at the foot of the craggy giant Lobhörner (2566 m). In the very town of Lauterbrunnen live about 2500 people, accommodation options are many. Necessarily sit down to drink a coffee in one of the cozy restaurants, offering freshly prepared and Swiss chocolate. If you want to try something from the traditional Swiss cuisine, you cannot help but order Rosti. The territory of the U-shaped valley today is considered one of the largest protected areas. Perhaps the most famous waterfall in Lauterbrunnen is Staubbach, located less than a kilometer from the Alpine resort. The distance passes in about a half hour’s walk. With a height of 240 m and 270 cascades, it is one of the highest in Europe with an uninterrupted drop. 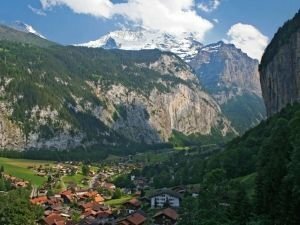 Back in 1779 the great Goethe visited Lauterbrunnen, the thunderous natural phenomenon inspired him to write the poem "Spirit song over the waters". Another amazing natural wonder is in the face of the waterfall Trümmelbach, where you will find Mount Black Monk. This waterfall reaches a height of 200 meters and in summer can be reached by tunnel lift from Lauterbrunnen, it is located 3 km from the village. Lauterbrunnen station is in northeastern edge of town, opposite the station Mürrenbahn. Behind it there is a several storey car park, Mürren and Wengen are fully pedestrian zones prohibited for cars. Lauterbrunnen is a starting point for conquering all peaks in the region and reaching the resorts. In town you will find everything you need if you plan to take the route recognized by UNESCO- Junggfrau-Aletsch-Bietschhorn.